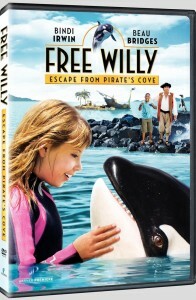 For those of you who are not familiar with ‘Free Willy 2’ or ‘Free Willy 3’ – you are not alone. The 1993 movie “Free Willy,” starring Jason James Richter as Jesse and Keiko the Killer Whale as Willy, was a great family film back in the day. The two films that followed cashed in on the famous title, but left viewers disappointed. The fourth movie in the ‘Free Willy’ series is set to be released just later this month. But timing is not exactly perfect, with all of the media coverage of the killer whale attack where SeaWorld trainer Dawn Brancheau tragically lost her life(read about the entire story here). The movie is set for release only a month after the trainer was attacked and killed by the whale. Although the movie has certainly been in production for some time now, it seems that the release is too soon. The movie stars Bindi Irwin – daughter of “The Crocodile Hunter” Steve Irwin, who ironically lost his life doing something that he loves. The movie also stars Oscar winner Jeff Bridge’s brother – Beau Bridges. The similarity between the two is remarkable. When first watching the trailer, I did a double take – before realizing that it was Jeff’s brother. They look alike, and sound very similar as well. The fun and adventure are back! Fans of the Free Willy series will cheer this exciting family film about a baby orca who needs a friend and a girl who finds the courage to help him. After young Kirra (Bindi Irwin) leaves her Australian home to summer with her grandfather (Beau Bridges) in South Africa, she soon discovers a baby orca stranded in the lagoon near her grandfather’s rundown seaside amusement park. She names the lonely whale Willy – and embarks on a great quest to lead the little guy back to his anxious pod before her grandfather’s greedy rival turns Willy into a captive, moneymaking attraction at his slick theme park. A little girl, a little orca and big, big fun and adventure! What do you think – is it too soon to release a movie like this? Leave a comment below!